I guess, his appetite is 2 Vada Paos, per meal !! The problem with our politicians is their tongues work faster than their grey cells. hahaha true that 🙂 12 bucks?? hahaha .. I doubt they think at all before stating ! hahahahaha sahi kaha Manu aapne .. sab alla kamaan ko khush karne mei lage hain aur rajkumar aur rani saheba .. chupchap tamasha dekh rahe hain ..
hahahaha.. he may open his own restaurant till 2014 elections are over ..offering food for 5 bucks .. and the quality of that would be as good as the Mid day meals !! 12 rs !! U from Mumbai .. can u name any eatery which gives sufficient meal for that amount ? The Congress has made fun of the poverty of the masses; this statement indicates that Congress is not in touch with the reality of the inflation…shame on such politicians. Nice cartoon! Glad you liked the cartoon and I don’t know how i skipped your comment .. sorry about that . That suits him well…deserves only a Rs.12 meal. 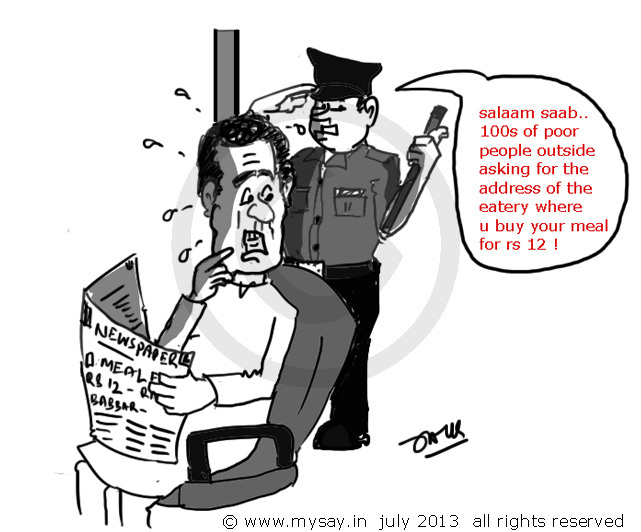 Imagine if the entire breed gets paid to afford a Rs.12 meal, how much will the nation save. Hypocrites!!! hahahhaa… true that .. for entertainment India has money to spend crores and crores and suddenly after minting crores .. these great gurus come for Samaj Sewa .. and show how poor they are .. that they know places where people can buy food for 12 bucks .. better he would have suggested the langar in gurudwara .. still believable !! All Big Mouth People ! I knew I’d see a doodle on this!! Rs 12 in Mumbai and Rs 5 in Delhi…do they even think before speaking such absurdities…they can’t do zilch for the poor of our country and now they are outrightly mocking them!! if he has opened his personal cheap food corner I dont know .. hehhehe for 12 bucks as I mentioned … 2 vada paos at the most 😀 if thats a proper meal then .. be it but only for him..
and Mr 5 bucks from Delhi .. he may be talking about the left over mid day meals in govt schools .. when the free meals packed with lizard tails and insecticides .. are discarded by children .. he may try selling that for 5 bucks 😀 .. they are doing nothing but making fun of the poor .. come 2014 .. Pappu and Mummy will pay for these Big Talks .. I am sure ! The ability to indulge in bunkum without a conscientious feeling is what makes a politician meant for the poor and famished people of our country fed with the dream of a better tomorrow. You have torn off the mask. I just WISH they get their facts right before they make such ridiculous statements, Jack! true dear friend .. they have made a joke of the monetarily helpless Indians !! Thank you for sharing this article .. going through it ..
Its fine 🙂 .Actually what are they trying? Lets suppose that ACTUALLY a man can survive a proper meal at Rs.5. (I’m gonna be cursed for even ASSUMING such a situation) What would that mean? I seriously want to know .. I don’t understand this game. the way the article ends is right .. we not asking you to eradicate poverty completely but at least speak sense dear leaders .. Farooq ji crossed all limits Re1 .. I mean what ? even Mahatma Gandhi , if alive, would have gone violent.. trust me ! food for Re 1 .. a meal ? even Mahatma Gandhi , if alive, would have gone violent.. trust me ! // I bet!!! hahhah…hey Jackie..i have done a post on the same topic 😀 Same Pinch!! Sigh!!!! And they are defending it strongly!!! Sigh!!! May be with age, he lost his taste buds! Poor for Indians. hahhaa.. true that may be !! hahaha Rs 12 ? hahha crazy statement. reply to your comment ?? Sab politicians ko sab chije free me mil rhi honhi na..tabhi aise bolte h.. ;p It’s all need is to take their political powers from them and then they will speak common man language. It will surely work. hehe :D. Maybe the Govt should start paying these people a daily wage of 36 bucks per day !! its time we do something about our foodless brothers .. I am doing my bit brother … I hope the entire nation does ..